Here I sit, taking a much needed break from cleaning the house to share with you a recipe for some delicious sunflower seed butter—you're right, I usually make peanut butter. And I still do, but Hannah isn't eating peanuts (or any other nut) yet, so I thought I'd stray from the norm for her sake. She loves sunflower seed butter, but I don't want her to get sick of it so adding some flavor to it seemed like the obvious play. Wait. Why doesn't she eat peanut butter? According to our pediatrician, it's best to wait until she's two to introduce any type of nut. Theory: If she has a reaction, it'll be easier for her to deal with it if she's older. I'm just fine with waiting. So "delicious sunflower seed butter" it is. I found some dry roasted sunflower seeds at Trader Joe's a few weeks ago, so that's where I started. Plain sunflower seeds come aplenty in any grocery store, but I'm all about making things as easy as possible these days. So buying pre-roasted seeds shaved some time off this adventure. Make note, if you buy seeds or nuts ahead of time, be sure to check the ingredients. Watch for added salts and hydrogenated oils, both of which decrease the "good for you" factor. To start, throw two cups of roasted sunflower seeds in your food processor. Whirl 'em and wait. They'll probably turn into a nice crumbly consistency at first. You'll need to have some patience here. It can take awhile for the oils to kick in. Once they do, the powder will thicken into a nice butter. Once it reaches a consistency you like, you can add in your flavors. 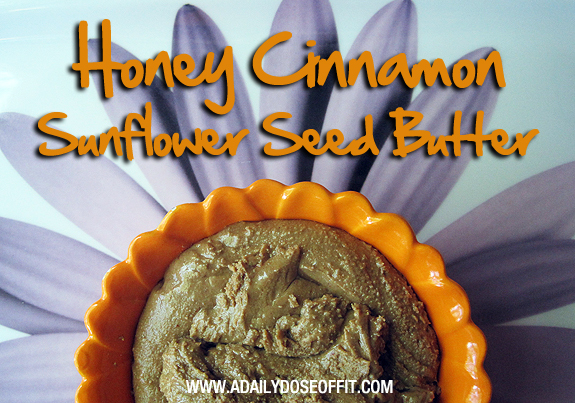 For a honey cinnamon sunflower seed butter, you obviously need honey and cinnamon. I ended up adding three teaspoons of honey and a teaspoon and a half of cinnamon. Add just a bit of each at a time. In fact, you might end up adding more if it suits you. This is the amount that worked for me and my taste buds. Make note: Honey tends to make nut butters a bit gummy, which is fine. But the more you add, the harder it gets if you end up storing it in the 'fridge. And I always keep my nut and seed butters in the refrigerator. So delish. I can't wait to share it with Hannah. I sense sunflower seed butter and jelly sandwiches in our future. She's obsessed with stepping on things. Weirdo cutie-pie kid! Love her. Don't forget to enter my FlipBelt giveaway! It ends Friday, July 19, 2013 at midnight EST. Question: Do you make your own nut or seed butters? If so, what's your favorite flavor combination? Ever mix nuts and seeds? Inspire me with your creations in the comments below! Feel free to share links if you have recipes on your blog! Such a yummy sounding (and looking!) recipe! I've made sunbutter before but didn't add any sweetener or spices and it wasn't my fav but I think honey and cinnamon would be a great addition! Plain sunflower butter tends to be a little more savory than peanut or almond butter, I think. Try it with the added flavors, I find them to create the perfect amount of sweetness! Doctor allows sunflower seeds but not nuts? isn't sunflower seed also a nut? And, peanuts is not actually a nut, it's a legume...!!! Sunflower seeds aren't nuts, They're SEEDS. And the risk of an allergy is low. Peanuts, on the other hand, are a dangerous allergy to have so many pediatricians encourage parents to wait until the baby is older to introduce them.